A Collection of 12 metals, in a softwood box with glass front, paper mounted, size 225 x 150 x 35 mm. 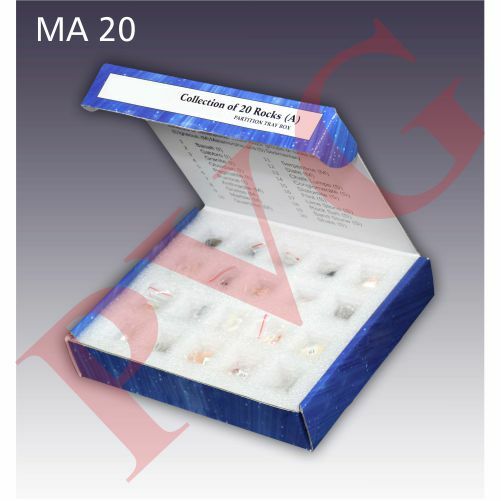 A comprehensive collection, set of fifty specimens of different types of rocks, each specimen of size 25-30 mm is enclosed in a labeled transparent bag; in polished wooden box having different compartments, with glass top and descriptive label in the box lid provides the geological name of specimens. Size 375 x 300 x 45 mm. A collection of 20 alloys, in a softwood box with glass front, paper mounted, size 300 x 150 x 35 mm. Designed for the beginner astronomers. For terrestrial or celestial viewing. The tube is 100 x 50 mm and features rack and pinion focusing, a 2 x finder scope, and a removable 35 x erecting eyepiece. Includes a 2 x Barlow lens and an adjustable metal tripod. 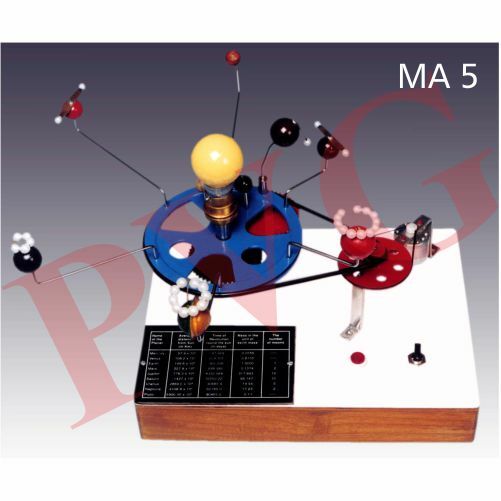 A simple hand operated model. Demonstrates the relationships of sun, moon, and earth and their positions and movement throughout the year. For the extraction of geological specimens. 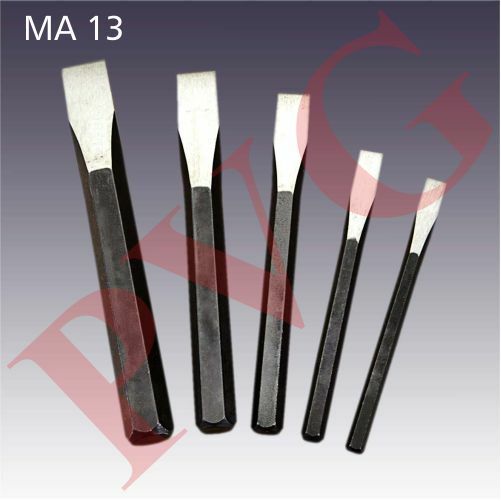 Set of six Wear protective goggles while using these chisels. 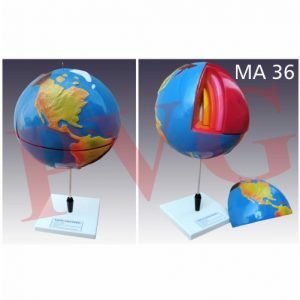 Model on stand shows outer surface, crust, mantle outer core, inner core. A Collection of 20 earthy minerals, in a softwood box with glass front, paper mounted, size 300 x 150 x 35 mm. 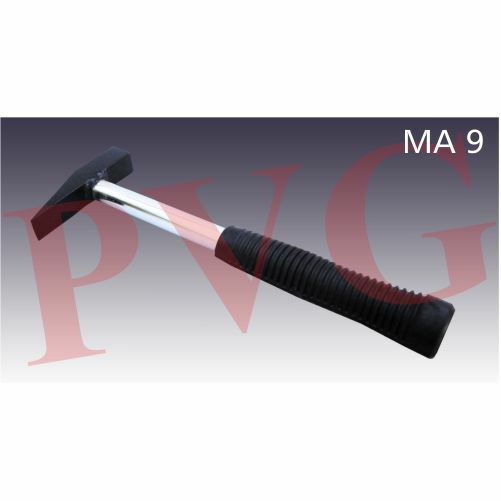 Professional pattern, single piece forging including handle which has cushioned nylon vinyl hand grip, chisel head. Mass 500gm. Physical, non relief vinyl inflatable approx. 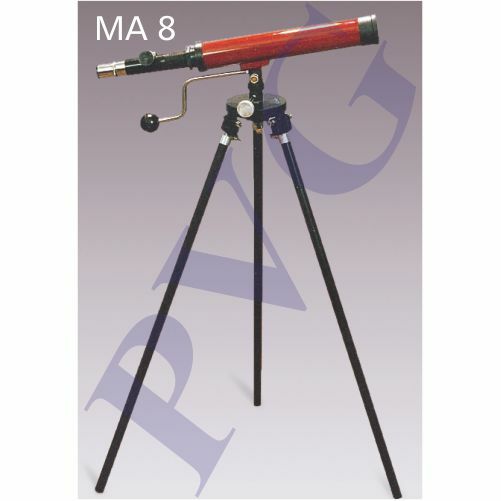 300 mm diameter with metal arc, tilted axis on metal stand. Also available with diameter 405 mm. 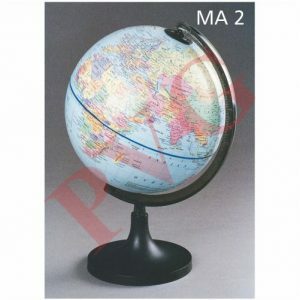 Vinyl inflatable, non relief, diameter 300 mm, with metal arc and plastic stand base. 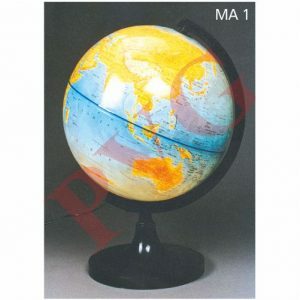 An economical globe in 200 mm diameter. Feature eight Land form models join to form a continuous model and provided the Mountains, Lakes, Arrivers, Deserts, Glaciers, Coastlines, Canyons an cultural point. A collection of 12 metals and 12 alloys, in polished wooden box with glass top, size 300 x 225 x 40 mm. A collection of 20 metallic ores, in a softwood box with glass front, paper mounted, size 300 x 150 x 35 mm. 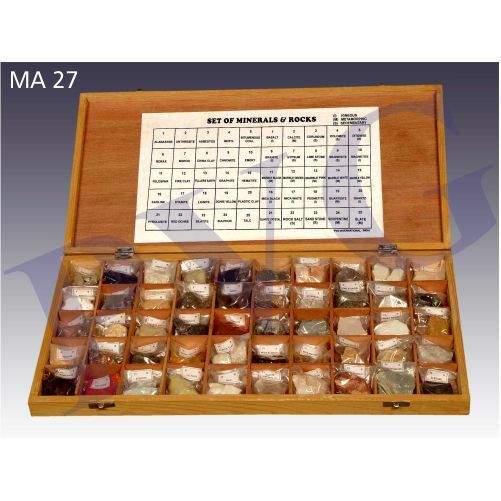 A comprehensive collection of 70 minerals, in a polished wooden box with glass top, size of box 300x450x45mm. A collection of 12 minerals, in softwood box with glass front, paper mounted, size 225 x 150 x 35 mm. A collection of 20 minerals. Size of box 300 x 150 x 35 mm. A collection of 30 minerals, in a softwood polished box with glass front. Size of box 300 x 225 x 40 mm. 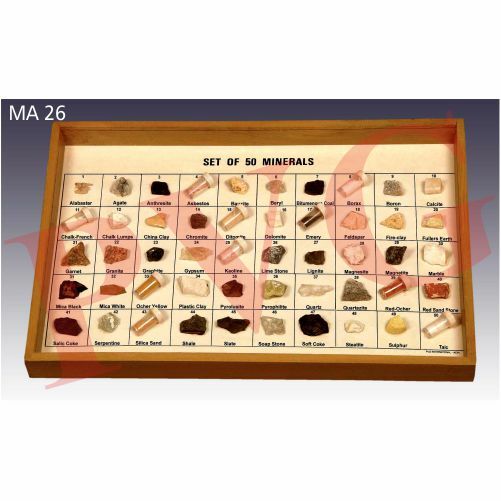 A comprehensive collection of 50 minerals, in a polished wooden box with glass top, size of box 300x450x45mm. Thin section of rocks & minerals on glass slides 75 x 25 mm, Packed in die cut boxes of size 175 x 125 mm. with teaching notes. Available in set and individual slide also. (I) Set of 20 Rocks slides. (ii) Set of 20 Minerals slides. Set of 45 rocks, a collection of 15 Igneous, 15 Metamorphic and 15 Sedimentary in polished softwood box with glass top, size 350 x 250 x 40 mm. 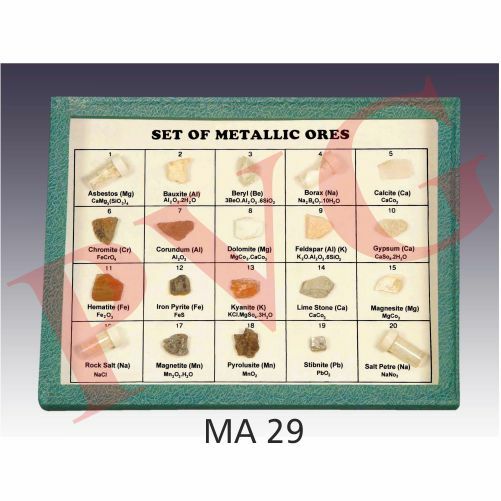 Set of 20 rocks each of size 25 – 30 mm, in softwood box with glass top, paper mounted, size 300 x 150 x 40 mm. 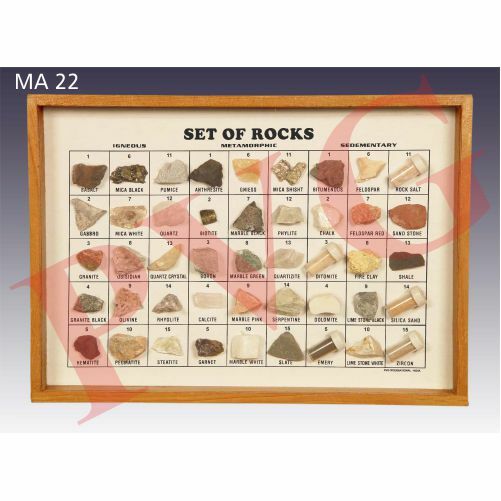 Set of 12 rocks each of size 25 – 30 mm, in softwood box with glass top, paper mounted, size 225 x 150 x 40 mm. White glossy cardboard or wooden with sunmica pasted. A collection of 36 rocks samples and 64 minerals, each specimen approx. 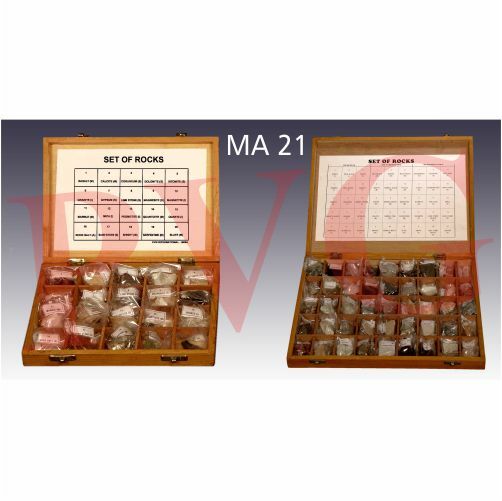 30-40 mm is labeled and enclosed in a transparent begin a polished wooden box size 400X400X500 mm having different compartments and with a descriptive label in the box lid which provides the geological name. A collection of 25 rocks samples and 25 minerals, each specimen approx. 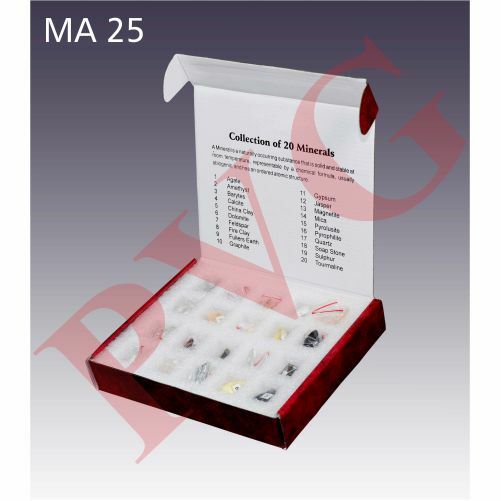 30-40 mm is labeled and enclosed in a transparent begin a polished wooden box size 530x270x45 mm having different compartments and with a descriptive label in the box lid which provides the geological name. Stacking tinned steel sieves with perforated stainless steel sieve elements, lid and bottom receiver. 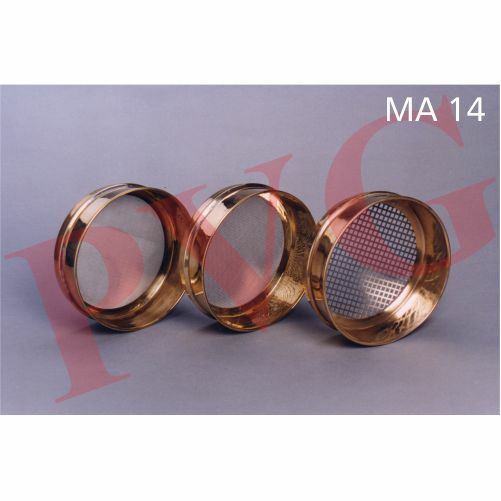 Each sieve can be used independently or stacked together with lid and bottom receiver for fractionation of soils or sediments. For taking out solid cylindrical samples from a deep source. 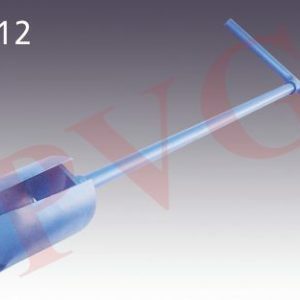 Consist of a steel tube with cutting edge at lower end and having index line at 250 mm. With Tommy bar and safety chain. Dimensions 500 x 50 mm length x diameter. Internal diameter 47 mm. Length of Tommy bar 300 mm. Mass 1.5 kg. Approx. Heavy, Sturdy, easy to operate, efficient and low maintenance. For agriculture purpose to take out the samples of soil. 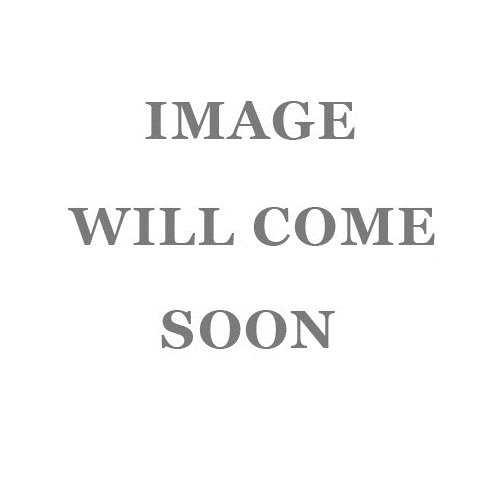 • set of two spanners and Tee piece. For determining particle size distribution in soils. With shot poised bulb. Range -5 to 60 g per litre, subdivided 1 g per litre. Calibrated at 200 C. Overall length 280 mm. Easy to operate, efficient and low maintenance. Sturdy construction, corrosion resistance, perfect finish, in mild steel with optimum performance and longevity. 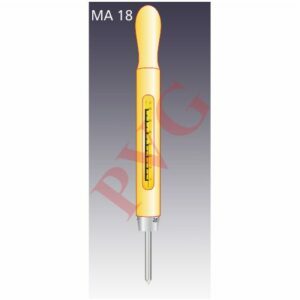 This is widely used to take a clean sample from a certain depth of various types of soils like hard, rocky, medium and high cohesion. 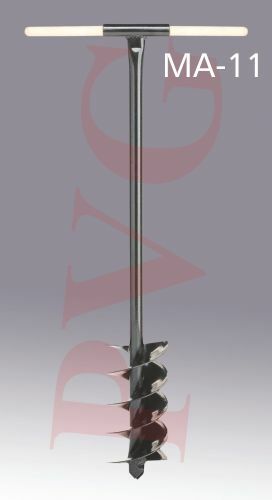 Complete with one meter rod & T shape handle Total length 1.5 meter. Depths of excavating can be increased by using additional extension rods. 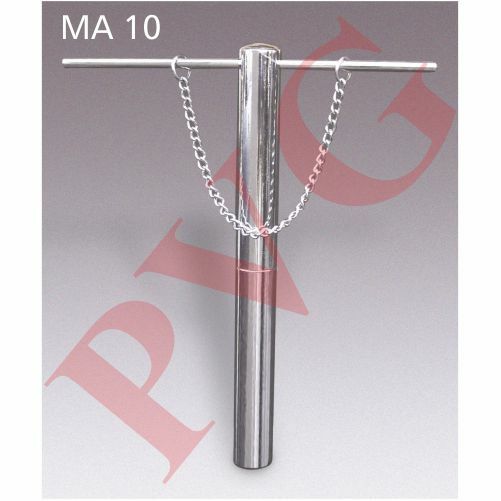 • Extension rod 1 meter length with threading at both ends & couplings. 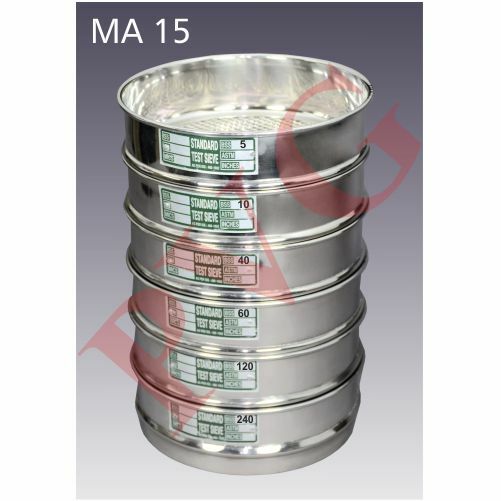 Sieves set of 6, Includes Lid and Pan, Diameter 200 mm. Economical sieves, made of stainless steel mesh with steel frames. 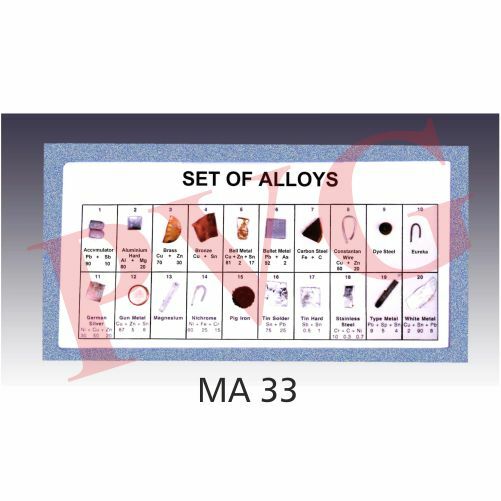 Used for geological particle sizing. Available as a set of 6 with a lid and a catch pan, or can be purchased individually. Mesh sizes: 5 (4000 micron), 10 (2000 micron), 35 (500 micron), 60 (250 micron), 120 (125 micron), and 230 (63 micron). As above but with brass case and mercury thermometer, range -10 to 1100Cx 10C. Dimensions : 450 x 10 mm..
Slotted aluminium case with red plastic ball handle and pointed end for easy insertion into the soil. 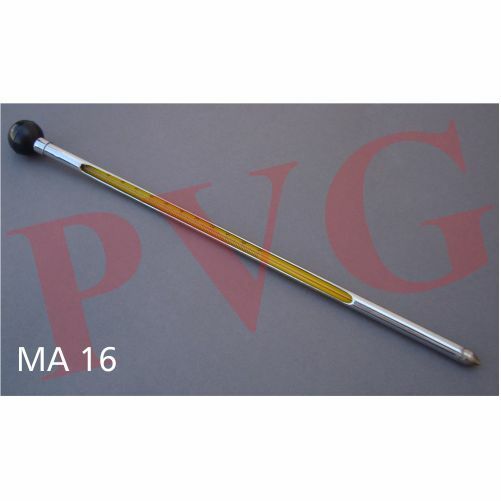 Enclose red spirit thermometer, range -10 to 1100C x 10C. Dimensions:330×10 mm. 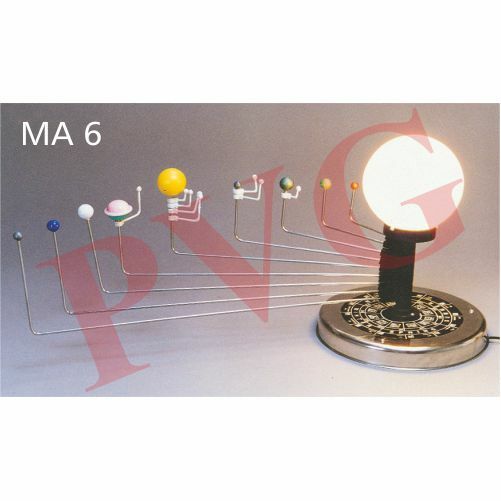 A three dimensional model of the sun and planets for teaching of solar system with planet identification, sizes, distances, and colors. Planets revolve around the Sun in the same plane but at different orbits. Their situation in the 12 zodiac signs can be shown on printed base. 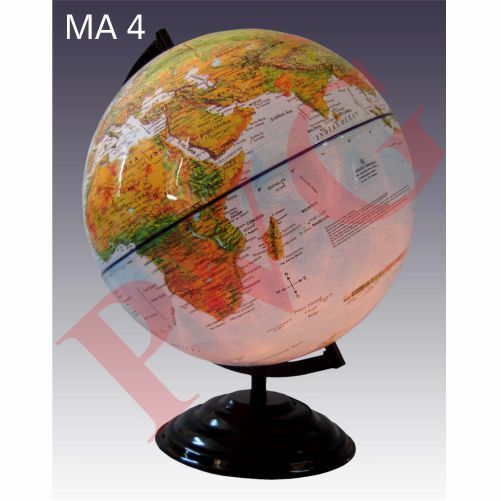 Sun is shown by bright globe illuminated by a light source inside. Base plate marked at every 300, and with four seasons. 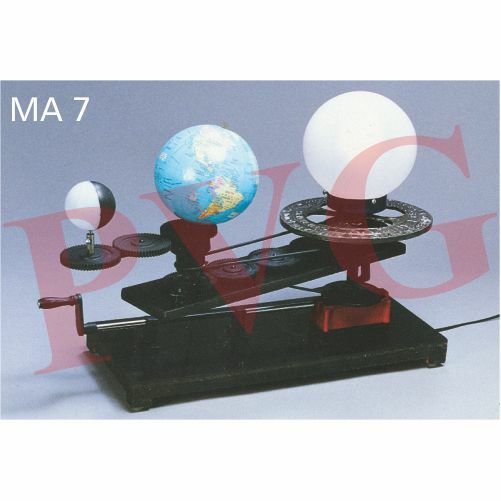 Motorized unit, depicting nine planets which revolves around Sun being shown by a bulb in the center. Planets are shown with their moons. Mounted on sunmica top wooden base fitted with mains indicator lamp and on/off switch. Top plate given with full details as name of planet, average distance from Sun (in Km) time of revolution round the Sun (in days) mass in the unit of earth mass and the number of moons. Overall dimensions length x width x height 300 x 220 x 150 mm. Approx.